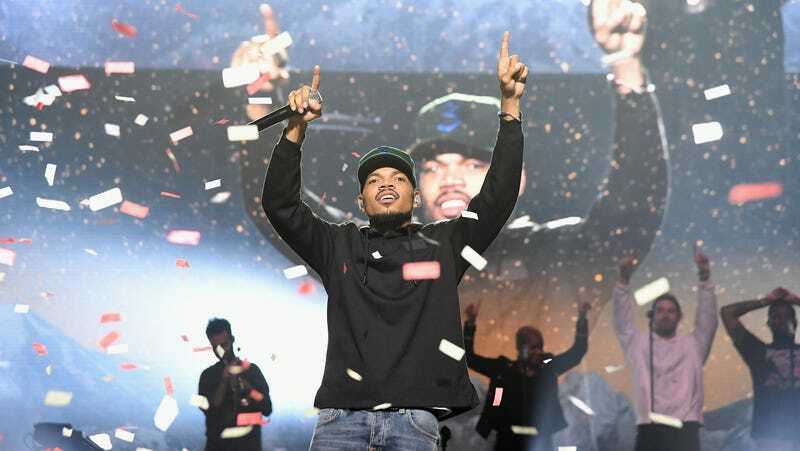 Chance The Rapper performs onstage during Chance The Rapper to Headline Spotify’s RapCaviar Live In Brooklyn in Partnership with Live Nation Urban and Verizon on September 29, 2018 in Brooklyn, New York. He’s best known for hit songs, industry independence, entrepreneurship and philanthropy, but the ever charismatic Chance the Rapper is about to add a new title to his growing list of credits, as producer of an original musical for Metro Goldwyn Mayer Pictures (MGM). Along with the legendary studio, Scott Bernstein (Straight Outta Compton) and his manager, Pat Corcoran, Chance has acquired the rights to develop Hope, a feature-length musical. Fellow Grammy award-winning composer, producer, Chicagoan and collaborator Nico Segal, also known as “Donnie Trumpet” will helm the film’s composing team, while the screenplay will be written by Carlito Rodriguez, a veteran of both FOX’s Empire and HBO’s The Leftovers. According to a press release, Hope’s story centers on “a group of Chicago teenagers that band together to turn art into action within their community.” It’s a narrative not far from Chance’s own. A native of Chicago’s South Side, his activist roots led him to cofound (with his father, Ken Bennett) the anti-gun violence organization #SaveChicago. He also created the empowerment organization, Social Works, and has continuously contributed his talent, high profile and earnings to educational, political and development efforts in his hometown.